Notice a theme so far this year, in addition to bread? I love weekend breakfast. 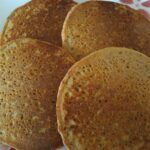 Recently, this has involved me baking every weekend, but I changed things up last weekend by trying Almond Flour Pancakes. It was a very easy and fast recipe, gluten-free but with a short, uncomplicated ingredient list. There was also a pomegranate syrup I could have made, but I was absolutely fine with the pancake syrup I had in the fridge.The pancakes browned well (on the first side – no pancakes brown well after flipped), which really made them seem pancake-like. They smelled eggy while they cooked, but I didn’t notice it when eating them. Alex really noticed the different texture. 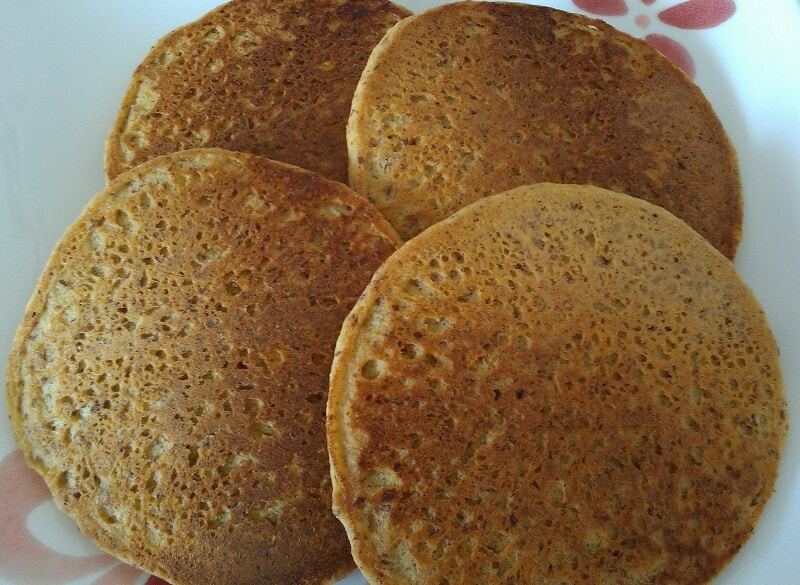 The pancakes were moist and soft – think marzipan without the sugar, or a very soft cornbread. They were tender and a little fragile and crumbly. If you like your pancakes on the savory side, make them as above. I don’t. Next time I will cut the salt back or out entirely, and add about a tablespoon of sugar. That said, you don’t notice the salt that much if you eat them with syrup. The almond flavor in these was subtle; I would add 1/4 to 1/2 teaspoon almond extract if I wanted something that really screamed almond. I was really pleased with this recipe. It’s gluten-free, relatively low carb (if you’re into that thing), and has healthy fats and a good amount of protein. The pancakes were simple to make, cooked well, and didn’t require unusual ingredients to replace the flour. I would make these pancakes again in a heartbeat. Combine almond meal, baking powder, and salt (and sugar). Separately, whisk together eggs, vanilla, and almond milk. Pour into almond meal mixture and mix until thoroughly combined. Heat griddle to about 375F. Oil griddle, and pour 1/4 cup batter per pancake. Cook 4-5 minutes on the first side, until a bubble or two pops up through the batter or the sides of the pancakes are dry. Carefully flip pancakes and cook another 1-2 minutes. Serve warm with syrup.